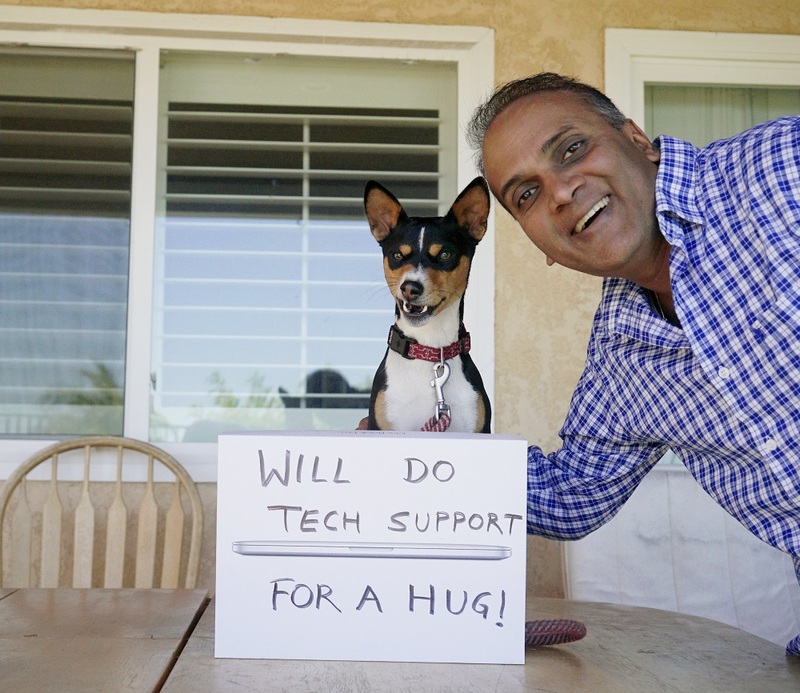 Life lessons learned from a dog: when an Indian American comedian brings home a new puppy. Last year, at the dinner table, my youngest son said, “Dad, I want a puppy.” I said, “Son, we are vegetarians. Now finish your Aloo Gobhi.” He wasn’t amused and said, “Come on, Dad. Can you be serious?” For the next several months, he kept insisting. My two older kids had also tried convincing me to get a dog for several years, but I refused because it seemed like too much work. When they all promised to do their fair share, I agreed as long as the dog was small, kept things clean and didn’t bark much. They did the research and decided to get a Basenji because they don’t shed, they cannot bark, and are super intelligent. Naming our puppy was hard. We thought about trying Indian themes influenced by traditional stereotypes like: Curry, 7-11 or Kama Sutra. We knew we couldn’t name him after Indian gods or leaders because it may be frowned upon in the Indian culture. We ended up naming him after the famous British Computer Scientist, Alan Turing. There were some reservations about naming him after a British guy. Would we call him Master Turing? After we got Turing, we were miserable for a few days. It was so much work. The thought of having a baby who would never be able to talk was depressing. We also read online that Basenji’s are not recommended for first time dog owners because they are escape artists. The thought of $850 just running away was even more depressing. We have been careful and he has become part of the family. Well sort of. Unlike other family members, he has managed to run away several times. Luckily, with some help from our neighbors, we have been able to get him back. Walking with Turing is an interesting experience. Once we ran into an Armenian lady with a dog at a park. Her Alaskan Husky and Turing got along well. She asked if we were from India and when we confirmed, she said, “Oh, my God! You are Indian and have a dog! There are so many Indians that live in my complex and they all are afraid of dogs.” It’s true. All the Indian people we meet at the park, avoid him like the plague. I used to be like that too. I wasn’t afraid but I wasn’t very fond of them. Growing up in India, I only saw stray dogs on the streets. Many of them have diseases, so you avoid touching them. Indian movies didn’t help either. A scene from a sad Satyajit Ray film where a rich kid is feeding chicken biryani to his dog while poor starving children look on, has always been in the back of my mind. My wife’s uncle recently confirmed that when his kids were growing up and asked for a puppy, he said he would rather have another kid than get a dog. As a Hindu, I believed that animals like dogs and cats are work in progress. If they continued to do good, they would get the privilege of coming back as a human. Finally, my bias against dogs was also because I am a vegetarian. The idea of someone licking my legs while he just ate lamb or chicken was not appealing. As a vegetarian, it is still difficult to overcome our phobia of meat but we have learned to manage. Turing’s partially used meat cans stay in one corner of the garage refrigerator and his spoons and bowls are kept separate. He is a true carnivore – he does not even touch any vegetable after smelling it. He must be cursing his luck that he is stuck with the wrong family. To occasionally treat him, my kids ask the Chipotle server to pack some meat toppings on the side, which he devours instantly. Apart from the benefits of “forced” daily walks and having a companion, Turing has taught me valuable lessons. When my wife wears a new dress, new bangles or gets a manicure, he takes the time to notice her. Now I have become more attentive to my wife’s attire. It is also a delight to see his reaction when any of our family members come back from their travels. He is just so happy his tail is constantly wagging. I wish human beings had an equivalent of a tail so we could tell who is genuine and who is faking. That would be very helpful especially in Hollywood. Being in the IT industry, I thought it would be cool if we taught Turing some new tricks so he can live up to his name. It turns out he already knew HTML. How to Mate a Labrador!